The WTA Finals are already underway as the eight best female players in the world will battle it out at Singapore to see who’s numero uno at the season-ending championships. Serena William’s withdrawal from the championships opened the door for Svetlana Kuznetsova who will be participating in her first WTA Finals since 2009. The draw for the tournament has already been out with the Red Group being a complete “Group of Death” including top seed Angelique Kerber, Simona Halep, Madison Keys and Dominika Cibulkova and the White Group consisting of reigning champion Agnieszka Radwanska, Karolina Pliskova, Garbine Muguruza, and Svetlana Kuznetsova. Let’s take a look at six players who are the favorites to win the season-ending championships. She might have reached the final of the Australian Open in 2014 and the semi-finals of the French Open in 2009 but 2016 has by far, been Dominika Cibulkova’s most consistent year to date and as a result will make her debut in the WTA Finals. After undergoing an Achilles surgery last year, Cibulkova began 2016 ranked 38th in the world. After reaching the semi-finals of the Hobart International, Cibulkova lost in the first round of the Australian Open which caused her to drop out of the Top 50. However, she rebounded to reach the final of the Alberto Mexicano Telcel at Acapulco. After disappointing performances at Indian Wells and Miami, Cibulkova won the Katowice Open by defeating Camila Giorgi in the final. She continued her good form by reaching the final of the Madrid Open where she lost to Simona Halep. This caused her rankings to rise up to 25 before the French Open where she eventually lost to Carla Suarez Navarro in the third round. She began her grass-court season well by winning the Eastbourne International where she upset Agnieszka Radwanska in the quarter-finals before defeating Karolina Pliskova in the final. Cibulkova once again got the better of Radwanska in the fourth round of Wimbledon to reach her second Wimbledon quarter-final where she lost to Elena Vesnina. Cibulkova returned to the Top 10 after reaching the semi-finals at Stanford but later had to deal with injury issues towards to end of the grass-court season. She injured herself again at the US Open and was eliminated in the third round. However, she returned to fitness just in time and reached the final of the Wuhan Open but a first-round loss at the China Open put her Finals qualification hopes on the edge of the cliff. 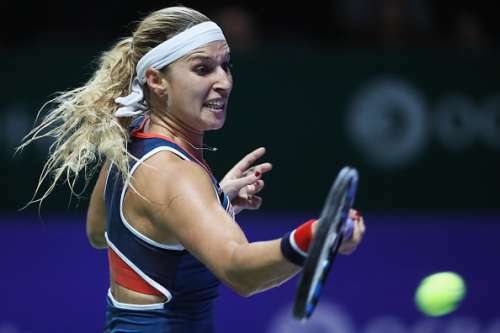 Cibulkova then confirmed her qualification for the WTA Finals by winning the Linz Open. Cibulkova has been drawn in the Red Group alongside Angelique Kerber, Simona Halep, and Madison Keys. Her chances to make it out of the group might not be massive but given her consistent form, it wouldn’t be a surprise if she does qualify for the semi-finals.